Maybe you’re tired of getting drenched as you dash to your car on stormy days. Or you dream about having more space for storage, a workshop, a home gym, a kids’ play area, or even an office. 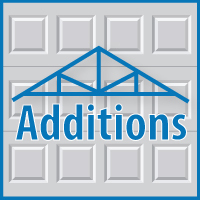 If you’re thinking about a garage addition, it’s a decent investment. Remodeling magazine’s Cost vs. Value Report found that a home owner who invests the national average of $48,806 in a midrange, two-car garage addition can expect to recoup about 64% of the cost at resale. For more pictures of garages we have built, please view our Garage Gallery.